I could not ask for a better mother – she is everything I hope to be. As I have gotten older and am now a mother myself, I’ve grown to appreciate her more and more. As her “adult” child I truly consider my Mom my best girlfriend. She is always a voice of reason for me, always encouraging me to take the high road and do my best, full of kindness, amazingly supportive and a wonderful listener. My Mom is such a joy to be around and when we get together we always laugh so hard and have the best time! This mother’s day I wanted to make my Mom something really special. Sadly for me my Mom lives many miles away down in Texas, so we don’t get to spend nearly has much time together as I would like. 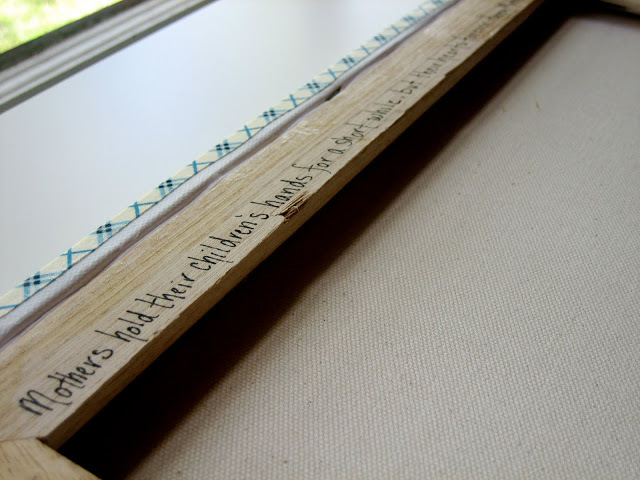 I saw a variation of this project by a guest blogger, At Second Street, over at The Trendy Treehouse and it inspired me to do a version of my own. 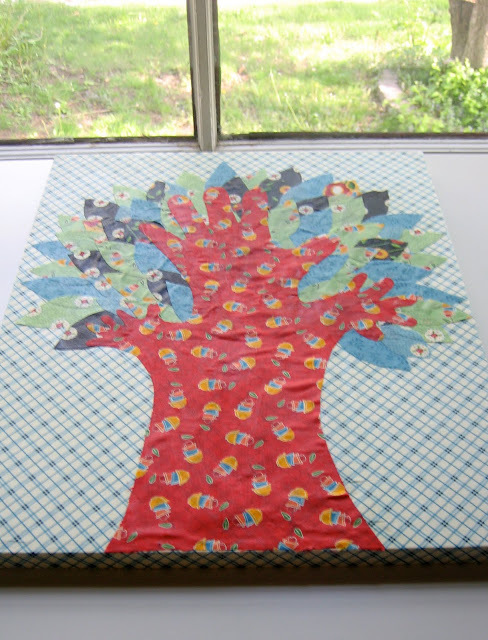 This tree is made from Mary Engelbreit’s “Recipe for Friendship” fabric line. 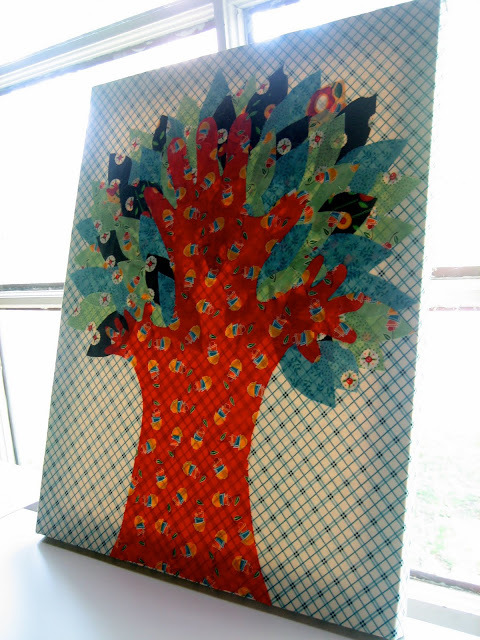 My Mom is working on re-doing her sewing room and I knew this art-work would go great with the rest of her decor. 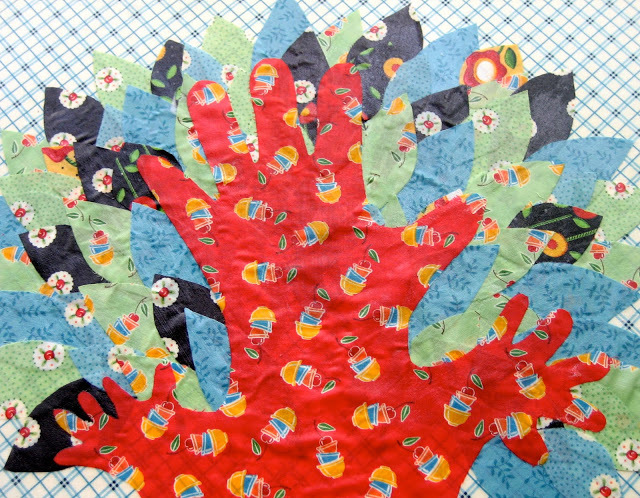 The branches of the tree are made from our handprints. The big middle one is mine and the other two are my daughters – Savannah Rose (2-years old) on the right and Matilda Jane (10 months old) on the left. I used mod-podge to adhere everything to a standard artists canvas. I even mod-podged the background fabric, though you could certainly use a staple-gun to attach this piece. 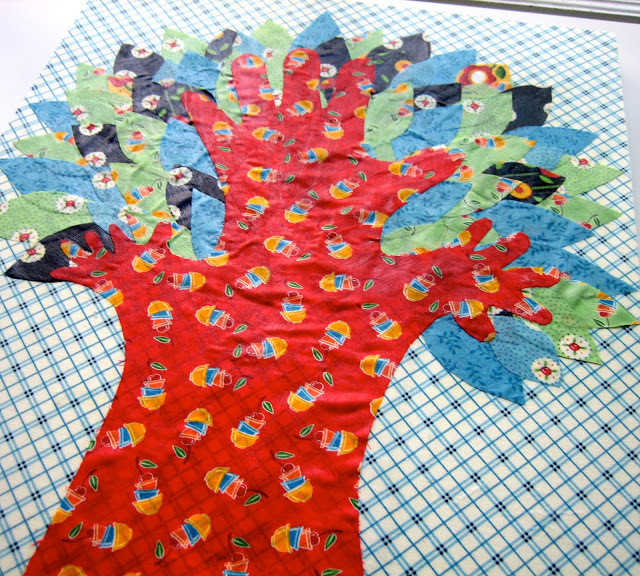 The leaves were made from several different green, blue and black fabrics – I wanted them to be different from the main trunk of the tree, though some of the fabrics did have flecks of red to tie them altogether. On the back I wrote a quote from unknown, “Mother’s hold their children’s hands for a short while, but their hearts forever”. This was an incredibly fun project that even my 2-year old was able to help me with. This would also make a wonderful gift for a mother or grandmother for any holiday (i.e. birthday or Christmas). Try using different combination’s of fabrics to tie in with the gift recipients room decor. 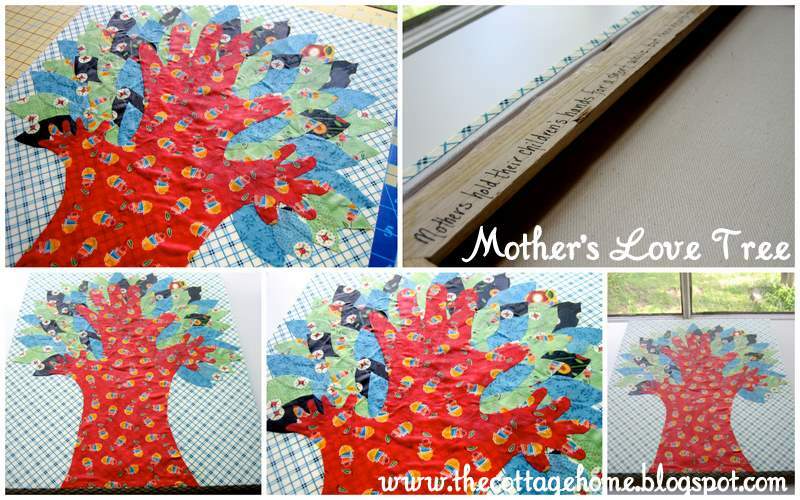 Or perhaps you would like to make a “Family Tree” and have a branch represent each member of the family with Mom, Dad, and all the kiddos – the options are endless with this fun project! 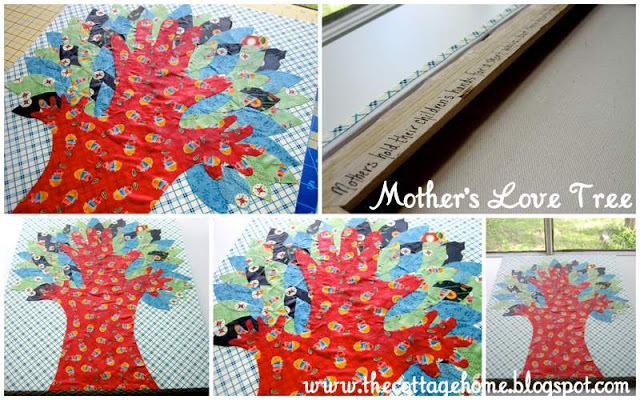 Cottage Mama’s Note: There is a wonderful tutorial on a similar project over at The Trendy Treehouse. 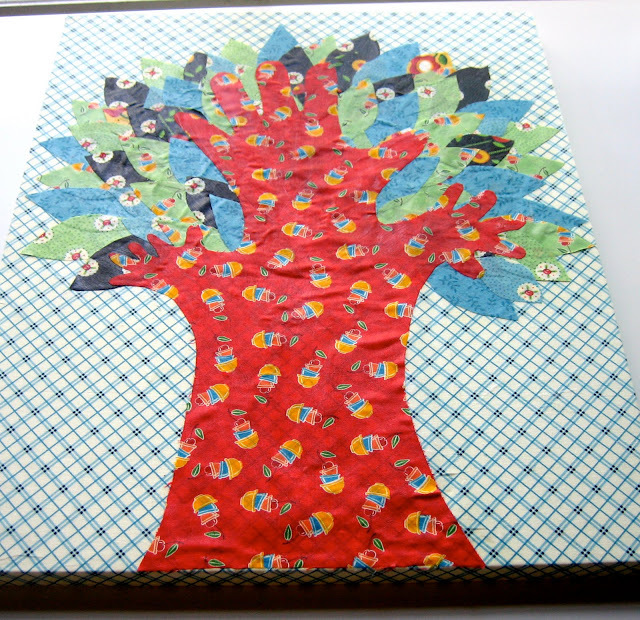 Guest blogger, At Second Street, did separate hand-print trees for each of her children using burlap as the background and more earthy color-tones. Check it out – she did a wonderful job! That is darling, I love the handprint idea! It looks fairly easy too. I am sure she will love it. Happy Mother’s Day to you and your mother. I LOVE the tree of love from you and am so proud of all you do! You are an inspiration to me! I am so incredibly blessed to be your mama! ILYFHTTMABA! Wow you did a great job! I love the idea. I will have to bookmark for a later project! What a lovely gift to give your mother. She is just as lucky to have a daughter like you!!! Very sweet!! I love things done with handprints. Thanks for sharing … I’ve posted a link.